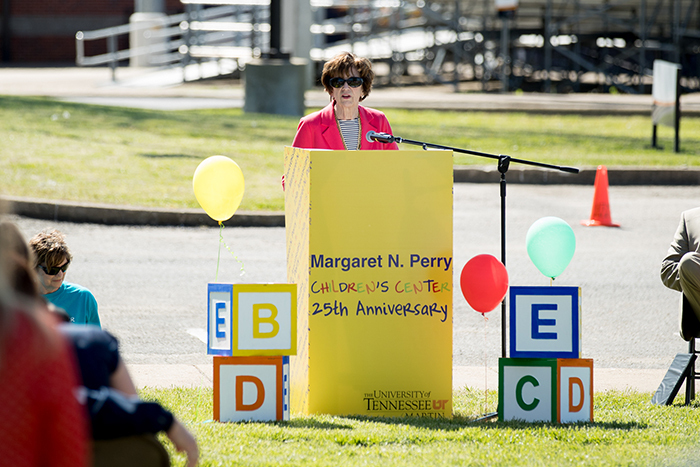 MARTIN, Tenn. – CHILDREN’S CENTER CELEBRATES 25 YEARS – The Margaret N. Perry Children’s Center on the main campus of the University of Tennessee at Martin celebrated 25 years in its current location with a reception April 30. The center moved into the current building on Pat Head Summitt Drive in 1993 and was named for Dr. Margaret Perry, UT Martin’s sixth chancellor, in 1998. Perry was present at the reception and spoke following comments from Dr. Keith Carver, UT Martin’s current chancellor. Leanne Snider, director of the children’s center since before the current building opened, also spoke about the impact the center has had on generations of Martin residents. She says 1,279 children have been enrolled at the children’s center since the current building opened. 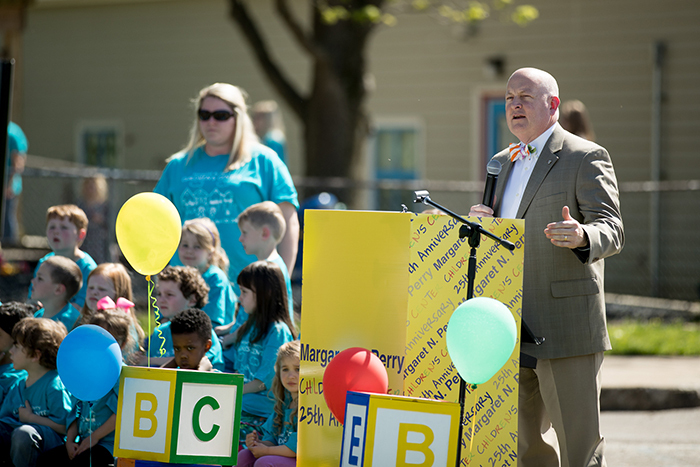 (above) Perry tells the audience how the current children's center building was constructed. (below) Carver thanks the crowd for attending and acknowledges the original donors who made the building possible.